The release of balloons into to the sky is usually a festive occasion. People release them while attending a celebration, honoring a loved one or kicking off a charity event. Unfortunately, balloons’ impact on wildlife has a different meaning. 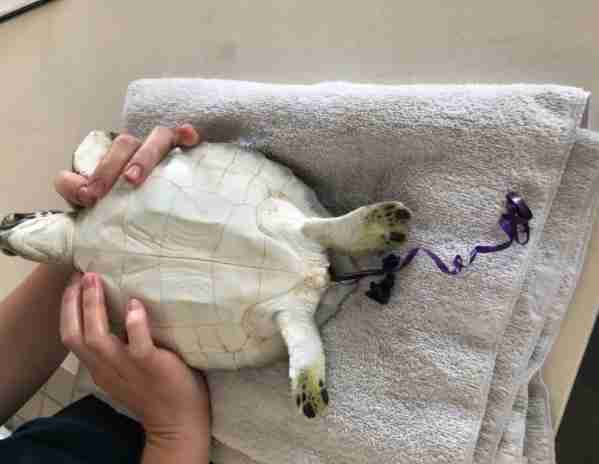 This juvenile green sea turtle, who had ingested one, was found floating in the ocean near Redington Long Pier, on the west coast of Florida. 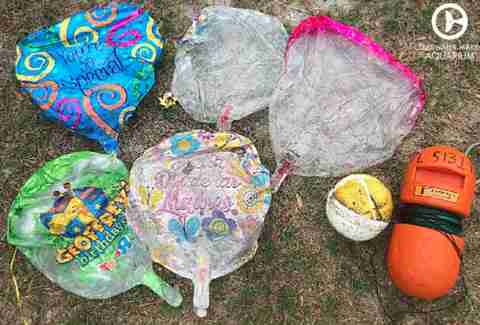 When balloons deflate and fall from the sky, they often wind up in the ocean, and become part of the 14 billion tons of trash that fill the seas each year and kill marine animals around the world. Chex would have another life lost if the rescue team at Clearwater Marine Aquarium (CMA) hasn't responded to a call from a Good Samaritan, who spotted Chex floating on the surface of the water. Sea turtles normally spend their time underwater, coming up every 20 minutes for oxygen. 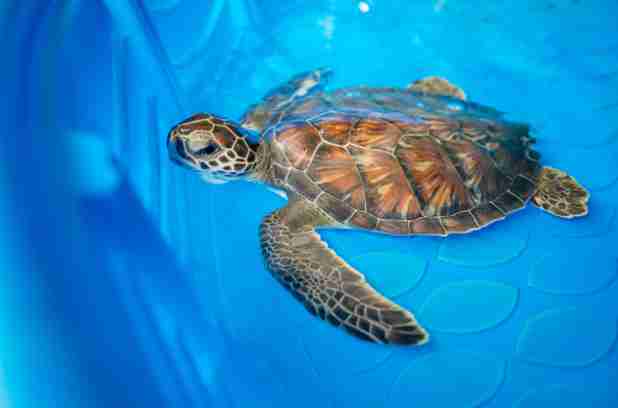 A floating sea turtle is generally suffering from gastrointestinal issues — this happens primarily when the turtle ingests plastic or a balloon and is called floater syndrome. The plastic becomes lodged in the turtle’s digestive track, trapping air and disrupting his ability to dive down. This leads to the turtle’s inability to feed or protect himself and, eventually, the turtle will starve to death. Chex, like many turtles, probably ate a balloon because he thought it was a jellyfish. 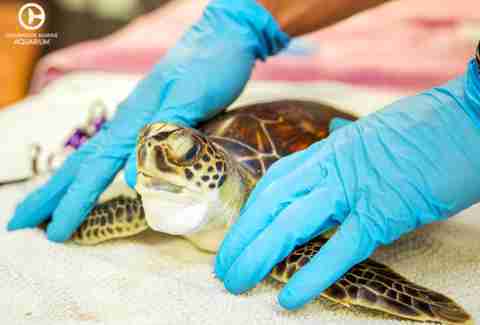 “Trash ingestion, such as plastic bags, balloons and other nonbiodegradable plastics, are virtually impossible for us to detect with X-rays, CT scans or other diagnostics until it is too late,” Lauren Bell, a associate sea turtle and aquatic biologist at CMA, told the Dodo. The team watched Chex very closely. His rehabilitation included monitoring his food intake and keeping him in shallow water, increasing the depth of his pool a little at a time as he became stronger. 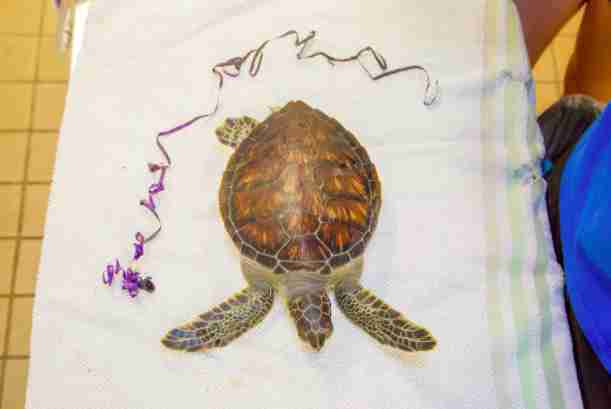 Eight days after arriving at CMA, Chex passed the balloon — and the ribbon attached to it. “We are very lucky that Chex was able to pass this balloon and ribbon on his own with little to no complications,” Bell said. Chex spent a total of 66 days at the aquarium recovering until he was healthy enough to be released. “To say being able to release an endangered species, like Chex, back into the ocean is gratifying would be an understatement,” Bells said. During his rehabilitation, CMA set up a webcam so that people could follow his progress. Bell believes that every animal who comes to the aquarium’s hospital has an important message to share with everyone. “If we are able to inspire one person to make a change, whether it be disposing of fish line properly or using reusable bags at the grocery store, we are slowly able to better our oceans,” she said. 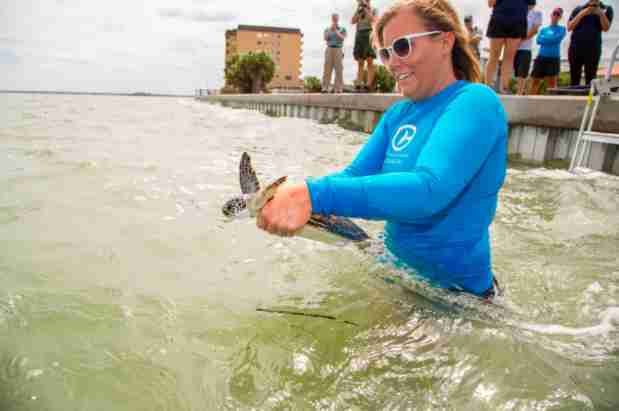 Clearwater Marine Aquarium is a nonprofit organization committed to rehabbing and releasing marine animals. You can donate to the aquarium’s animal care fund here.